The movie is set in 1891, one year after Vincent’s death. It focuses on Vincent’s suicide, mainly the why and how this little known artist chose to kill himself. It’s so bizarre to think that, today, Van Gogh is acknowledged to be the world’s most famous painter and yet died so unknown. 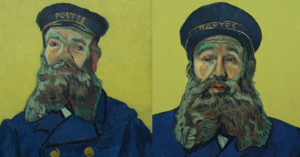 The characters in the movie are all made up of Van Gogh’s portraits, the postman, below was one of my favourites. It is a masterpiece of imagery. 115 artists around the world worked on the 65,000 painting used to make up the film, using a mind boggling 265 gallons of oil paint! Their work stays true to both the style and palate favoured by Van Gogh.I found the dialogue to be a little clunky and the Irish accents popping up were a little peculiar but the overall experience is fantastic. When the film meanders back in time to when Van Gogh was still alive the style of painting alters and the palate changes to black and white. It is in one of these scenes I learnt of Vincent’s constant desire to please his father and ‘fit in’ to society. This makes his quote “I wish they would take me as I am”, all the more poignant. I always thought this referred to the art market but now I feel a little differently about it. If you are looking for something unique and beautiful to watch, then get along to Loving Vincent, especially while it is still on the big screen.